Q. 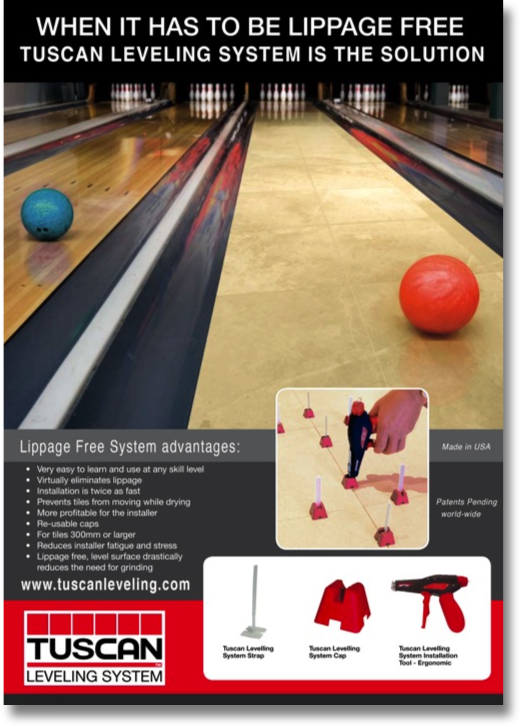 Does the Tuscan Leveling System help eliminate lippage? A. Yes, When using our unique patented edge leveling system, it virtually eliminates lippage. Q. Where is the Tuscan Leveling System made? A. The Caps, Straps and the HellermannTyton tool are all made in the USA. The 'Ergo-Plus' and the 'Iron Tool' are made in Italy. Q. Will the Tuscan Leveling System work with ceramic tiles? A. Our edge leveling system will work with ceramic, marble, onyx, granite, and most composites. Q. Will the Tuscan Leveling System work with small tile? A. Our edge leveling system is designed to work with tiles 12 inches or larger. The larger the tile, the cheaper the per-square foot cost is. Q. Will the Tuscan Leveling System work on large format tile and slabs? A. Yes, the system was created for large format. Our edge leveling system is ideal for leveling these large form materials. Q. Will the Tuscan Leveling System work on large very thin format tiles and slabs? A. Yes, the trend worldwide is moving toward thinner and larger format tiles, and our our product, with a patented mechanical edge leveling system, is ideal for these large thin materials. Q: Do I have to be a pro to use the Tuscan Leveling System? A: No, the DIY customer can benefit as well, as our system is so easy to use. Our edge leveling system is not intended to replace the skill it takes to properly install tile. Todays professional tile installer uses the our edge leveling system to help obtain a flat surface, with minimal or no lippage. Our edge leveling system gives the pro and the DIY installer an advantage, but it can't replace education and experience acquired in an ever evolving technical trade. When using our edge leveling system, make sure you are working within the tile industry standards. Q. What is the achievable grout line using the Tuscan Leveling System? A. The thickness of the strap is 1/32'' however, recommended industry standard for grout lines is no less than 1/16'' wide. Most commercial spacers can be used with the our edge leveling system to achieve up to a 1/2'' thick grout line. Q: What kind of grout do you recommend for a 1/32'' grout line? Q. What is the learning curve using the Tuscan Leveling System? A. Usually the learning curve is only a few hours, not days. Q. How do I profit by using the Tuscan Leveling System? A. In most cases, installation time is 2 to 3 times faster, which puts money in your pocket when the job is bid on a square foot basis. Additionally, as installer, you can usually pass on the cost of our edge leveling system to your client as part of the cost of the job. Q. Will there be voids under the tiles after using the Tuscan Leveling System? A. Our edge leveling system has passed all of the fourteen steps of the Robinson Test, which proved there are no voids created when using the system, as a result, the our edge leveling system earned the highest commercial rating possible for ceramic tile. We strongly recommend that installers 'back-butter' the tiles as a standard part of the installation process when using our edge leveling system. Q. Can the caps be reused? A. Installers report that they have reused the caps dozens of times, which greatly reduces the overall cost of installing. We felt was that it was better, with respect to the environment, to make a sturdy quality cap (although more expensive) for the professional, that can be used dozens of time, rather than a cheaper cap that wears out much more quickly and ends up in a landfill. Q. What do I do if after many installations of using the caps over and over again, sometimes I may have one cap that does not grip properly? A. The caps will eventually wear out. If you have a cap that is not holding, simply set a second cap over the first one and tighten. Mark the worn out cap with a Sharpie, so you will know which one to throw away. Q. Does the Tuscan Leveling System pull the tile up? A. A properly installed tile takes many more pounds per square foot to pull up, than it takes to push a freshly set tile down. The straps are not designed to pull up a lower tile to be flush with the higher tile. The straps and caps are engineered to push the high tile down rather than pull the low tile up. Because the caps push the higher tile down, as a result, the tile doesn't get pulled up away from the substrate. You will see the thinset in the grout lines slowly rise (from the tile being pushed down) as you tighten the strap. When our edge leveling system is installed properly, it makes the tile flat to begin with, then holds the tile in place and prevents the tile from sinking as the thinset cures. Q: Can you use the Tuscan Leveling System with travertine? A: Yes. The very first beta test and video we did with our edge leveling system was using travertine. If your travertine is not gauged, then the Wing Strap (for ungauged material) may be more appropriate than our regular strap. The Wing Strap will handle up to a 3mm difference in thickness. In most cases using our edge leveling system will eliminate, or greatly reduce the need for grinding. Q: Does my floor need to be level prior to installation? A: Yes, for best results it is advisable to follow standard professional practices for substrate leveling. Our edge leveling system is not designed to level a floor if the substrate is not level. The new requirement for a flat floor is; you should have no more than an ⅛’’ difference in ten feet. Q. How much faster is the tile leveling process using the Tuscan Leveling System? A. Responses from actual installers indicate that in large open spaces the installation can be up to three times as fast. In smaller areas where there is significant cut up or fitting to be done, they report the installation time can be the same, or up to twice as fast. Q. How many straps per tile do I need for setting 8'' X 40'' wood grain ceramic planks? Q. What about tight joints and bowing with tile? A. You can achieve tight joints with the our edge leveling system only if the quality of the tiles will allow you to do so. Not all tiles are rectified precisely, and there will be bowing on some tiles that even our edge leveling system can't take out. Q. How do I use the Ergo Plus (Italian) Installation Tool? Q. How do I use the ergonomic HellermannTyton (American made) installation tool? A. Set the tool on STD, then turn the smaller red knob to level #1 to #5 to tighten and set tile (the higher the number the bigger the tile). To break strap after mortar has set: set tool on HVY, then turn red knob to highest setting #8. Q. Why are there different types of Installation Tools? A. The ergonomic American made HellermannTyton tool, and the Italian made 'Ergo Plus' tool are primarily for the professional installer and the cheaper manual tools are primarily for the DIY customer. Q. Do I really need to use the Installation Tool to remove the caps after the mortar has set? A. Some installers have reported that, after mortar has set, they find it easier to just kick the caps (or use a rubber mallet) in the direction of the grout line and they easily break away. However, we can't recommend this because, if using this option, one could scratch the tile! In addition, kicking the caps may loosen the metal tongue in the cap, rendering it useless. Q: What is the 'Wing Strap'? Q: Is there any difference how the 'Wing Strap' is used? A: Yes. When using the Wing Strap made for ungauged tile, set the installation tool on level #1 to tighten and bring the tile into alignment with each other. The Wing Strap has to gently coax the tile into the desired position through a 'rocking' motion. For example, if you have a line of 5 levelers in place, then carefully tighten the 1st, 3rd, and 5th straps, then the 2nd & 4th, etc. in that order, until you have gradually manipulated both tiles to be on the same plane. Q: What size of notched trowel do I use when using the Tuscan Leveling System? A: For the regular straps, which is only for gauged material, use 3/8'' or larger. For the Wing Strap that is designed for ungauged material, use 1/2'' or larger. Q. When using the Tuscan Leveling System, can tiles be walked on while the adhesive is still wet? A. Some people do, but there are so many variables in tile setting, that change with each particular instillation, we can’t recommend it, as with excessive weight, the bond could become compromised. Q. Do I need a fast curing rapid set? A. Our edge leveling system lowers the risk for uneven settling, as each tile is inter-locked, not allowing independent movement of each tile. One tile cannot settle unless all the other ones settle as well. By interlocking each tile to one another, allowing no independent movement of the tile, there is no real need for a fast curing rapid set. Q. Can the Tuscan Leveling System be used on walls? A. Yes. Because of the angle of the walls, the installation is made easier by using the manual tool. Q. Can the Tuscan Leveling System be used on ceilings? A. The Tuscan Leveling System is designed for floor and walls. Over the years we have heard of tile installers who have used the Tuscan Leveling System on the ceiling, however, as a company we have not researched it, nor do we sanction it. Q: Can I use Tuscan Leveling System with a traditional sand and thick mud base? A: Usually not, if you are using a sand base with very thick mud on top in the traditional way, because the mud is mixed too thick to allow our edge leveling system to work properly. When you have lippage and you put the installation tool to the strap, the high tile is not going to go down because the mud is too stiff, so the strap will break first. Also, the slurry that is sometimes created on top of the mud could interfere (after drying) with the breaking point at the base of the strap. Our straps, whether the regular ones for gauged material, or the Wing Strap for ungauged material, will not be suitable for all tiles in every type of application. Q: What about using Medium Bed and Thinset Mortars? A: The Medium Bed and Thinset Mortars are mixed 'loose' (but still within the manufacturers guidelines) so that the our edge leveling system will work properly. Please see the variety of recommendations for a Medium Bed and Thinset Mortars for use with the our edge leveling system on our website by Mapei, Laticrete, and Custom Companies. Q: What is the best thinset to use with the Tuscan Leveling System? A: Our edge leveling system is not thinset specific, it is designed to help eliminate lippage while installing the tile. We recommend you use the appropriate thinset, which is dependent on the material being used and the material being tiled over, as recommended by the thinset manufacturers, based on industry standards. Q. Why do you recommend soaking the straps in hot water prior to use? A. The nylon composition of the strap needs to absorb sufficient moisture so it will stretch properly during installation. Straps should be soaked for 30 minutes prior to use in hot (not boiling) water or for a minimum of four hours if room temperature water is used. Many installers find it convenient to soak the straps overnight (in room temperature water) just prior to the job. Q. Why make a strap that has to be soaked prior to use? A.The proprietary blended nylon composition of the strap was engineered so when sufficiently moist, the strap stretches, then as the mortar is drying, the mortar pulls the moisture out of the strap, as a result the strap tightens slightly, assuring the tiles don't move. When the mortar is cured, it has pulled the moisture out of the strap, making the strap brittle so that the strap can snap off cleanly, at the breaking point which is the micro-holes at the base of the strap. Q. How do I soak my straps in a hurry? A. For a quick last minute soaking some installers use a bucket heater. Fill the strap bucket with water, insert the bucket heater and after about 30 minutes they should be ready to use. A good way to determine if the straps are too dry (prior to soaking) is to bend the top of the strap toward the bottom plate, if they snap in the process it means they need to be soaked (tap hot, never boiling). Q: Do I have to soak the straps every time I use them? A: No. Normally soaking is a one time thing only, however, if you are using the straps in an extremely dry climate, you may eventually need to re-soak them at some point, prior to use. Q: Why do some of my straps break off while leveling the tiles with the installation tool? A: Although it is theoretically possible, in five years of selling Tuscan Leveling System, we have never had defective straps. Most of the time when straps break during the initial setting process, it is most likely the result of the straps not being soaked properly. For best results soak the straps for 30 minutes in hot water. Q: My straps have been soaked, but some are still breaking prematurely while installing? A: Assuming the straps have been soaked properly, the second most common reason is the thinset is too thick or stiff. When you have lippage and you put the installation tool to the strap, the high tile is not going to go down because the thinset is too stiff, so the strap will break first. Check all three of the recommended thinset lists from Mapei, Laticrete and Custom so that you can be sure you are using a proper thinset that is mixed on the 'loose' side, but still within the manufacturers guidelines. Q: My straps have been soaked, the thinset is loose, but some are still breaking prematurely? A : Installers sometimes will push the strap into place with the edge or the tip of their trowel. Most often they push against the place where the strap connects with the base. When this is done the micro-holes are compromised, leading to premature breakage. The straps should only be put into placed under the tile by hand. Q. Straps soaked, thinset loose, but some are still breaking prematurely? A. If you experience straps breaking during the initial setting process, your number on the setting tool could be set too high. Q. Can the straps be used if they are frozen? Q: Can you use Tuscan Leveling System on slate? A: No. As slate is cleft, or of a irregular layered nature, the straps could catch on high or on low spots. We don't recommend using the our edge leveling system on slate. 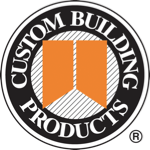 Q: Can you use the Tuscan Leveling System with Schluter's DITRA-XL underlayment and KERDI-BOARD? A: Yes. Follow the manufacturers installation guidelines. Q. What are the professional installers saying about the Tuscan Leveling System? A. Go to Testimonials When you look at our 'trade testimonials' page on our website, you will see endorsements and warranties from Laticrete, Mapei and Custom. We are the tile edge leveling system company working with Laticrete, Mapei, Custom, Schluter, Trend, Atlas Concorde, NTCA, TCNA, IMI and many other organizations and companies to promote and educate the industry, with regard to the new technology that we have introduced to the world as the Tuscan Leveling System. Q. Is the Tuscan Leveling System patented? A. Tuscan Leveling, Inc is the owner or exclusive licensee of the following United States Patents: 8,099,926 B2, 8,336,279, 7,621,100, 7,861,487, D630,077, D630,078, 7,954,300, D640,119, 8,011,164, 8,079,199 and D658,963 S; and the following foreign patents: Mexican Patent No. MX/a/2007/010219 South African Patent No. 2007/07945, South African Patent No. 2011/05079, New Zealand Patent No.561612, Russian Patent No. 2405895, Ukrainian Patent No. 95900, and Chinese Patent No. 200680009216.8. Hong Kong Patent No. HK1118587 Other patents pending, both foreign and domestic. Q. Where can I find a Tuscan Leveling System distributor? A. The Tuscan Leveling System is distributed in many countries world wide. In North America and the Caribbean, our master distributor is Pearl Abrasive, to find the closest local North American distributor use this easy zip code search. Pearl Abrasive is in the process of continually setting up new North American distributors. Contact them to see if you qualify as a distributor. Tuscan Leveling System Master distributors in other Countries can be found on our World-wide distributor page. Q. How can my company qualify to become a Tuscan Leveling System distributor? A. Send a request, via our on-line new distributor request form and we’ll get back to you. • Is changing the way the world installs tile. • Very easy to learn and use at any skill level. • Installation is twice as fast. • Prevents tiles from moving while drying. • In some applications, tiles can be walked on while mud is wet. • When the tile gets level, it stays that way. • Virtually lippage free, flat surface drastically reduces the need for grinding. • More profitable for the installer.